I haven’t been using my blog much lately (I mostly post on Facebook), but this seems as good a place as any for this review and English synopsis and translation of the first episode of Kosem Sultan — or, officially, Muhtesem Yuzyil Kosem, a new Turkish series that is the successor to the world-wide sensation, Muhtesem Yuzyil, the story of Suleyman the Magnificent and his beloved Hurrem Sultan. 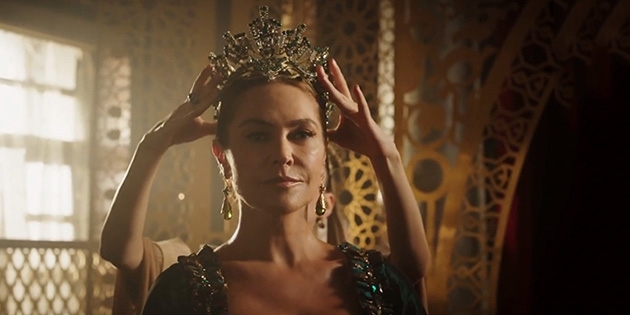 Kosem was the wife of Sultan Ahmet, the great great grandson of Suleyman. She was one of the most powerful women of the Ottoman dynasty. I know from watching Muhtesem Yuzyil that there are a lot of English speakers in many countries who can’t speak Turkish. I can, so I’m doing a synopsis and some translating. My Turkish is not perfect by any means, but it should give people who want to understand the story some help! I’m not sure how many episodes I’ll do this for–it takes quite a lot of time and I have books to write! I enjoyed the first episode of this show. 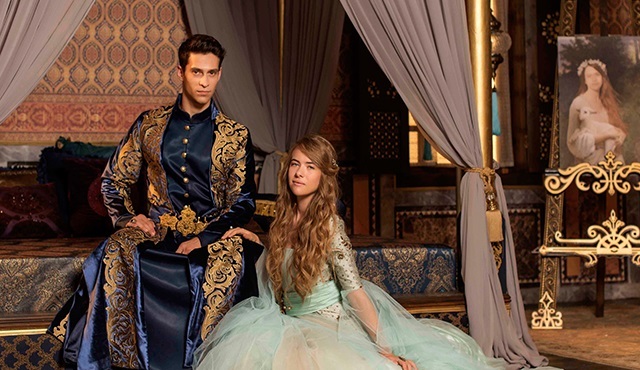 Granted, I did not enjoy it as much as I enjoyed the first episode of Muhtesem Yuzyil with Halit Ergenc as Suleyman and Meryem Uzerli as Hurrem–that was truly wonderful. But I hope Kosem will develop also into a great historical drama. The show runs on Star TV in Turkey and is produced by TIMS production, and produced by Timur Savci. For more info: Kosem Wikipedia entry, Muhtesem Yuzyil Kosem on Facebook, Star TV, TIMS productions. The episode begins with a voice over from the new Sultan Ahmet. “Ben Ahmet” – “I am Ahmet.” He recounts the story of how painful it is to be a prince of the Ottoman dynasty. “24 years to the day after the death of Suleyman, I was born. I grew up in Manisa. I was happy there. But when I came to Istanbul on my father’s death…what a happy day, but happiness lasted a short time. The fairytales about the happiness of princes are untrue. We either come to the throne or we die. From that day, I knew sorrow and fear. That was the day I learned that when the sultan takes the throne, the law requires that he kill his brothers. You have to follow the law, not your heart. Ahmet’s brother Mahmud promises, “One day, if I come to the throne, I won’t do what our father did; I won’t kill my brother.” Ahmet isn’t so sure about this promise. “I wanted to escape.” He and his brother watch the coffins being carried out of the palace after the new sultan ordered the deaths of his 19 brothers. We see Ahmet today growing up, swordplay with his older brother in their secret garden, which is the only place they can forget about the future that awaits them. But Mahmud gets into trouble when his mother Halime consults a fortune teller and word get around that she predicts Sultan Mehmet will die soon and Mahmud succeed him. Mahmud also spoke to the sultan about a rebellion that was taking place and Ahmet is horrified to hear it, because he thinks his father will order Mahmud’s execution. Sure enough, this is the last time Ahmet sees his brother—that same night he is strangled. Ahmet tried to stop it but is prevented. He understood that day that his biggest pain in his heart was losing a brother. He is then very depressed and the only thing that can cheer him up is being invited to his grandmother’s apartment, who is in deep sorrow on his account. There Ahmet first sees the portrait Anastasia holding a lamb. For the first time, the dark clouds lift. Safiye, the Queen Mother, notes his interest. He sets the picture up in his bedroom and often stares at it. She’s lovely, but there are probably other beautiful women. This girl is special. She is the embodiment of innocence. Whenever he looks at the portrait, the sorrow in his life fades and he is happy. He dreams one night that a droplet falls onto his heart and tree sprouts and grows from his chest. He sees it as a sign from God. He thinks he has died and is now part of the soil. Reluctantly, Ahmet goes to the sultan’s chamber. There is a crowd around the sultan’s bed. “My prince,” they all bow. He is taken to Safiye Sultan on the balcony. She says, “Mehmet, our sultan, my dear son, has left this world.” Ahmet looks back and see his father’s body. Greece: Meanwhile, somewhere in the Greek Islands, Anastasia is having fun, helping the village women trample grapes. She gets in a mock fight with a kid who’s spying, and her mother sees and get annoyed at her behavior. Sends her to her room. But instead she sees a horse, jumps on and rides to the sea. Her father, a prosperous merchant, meets up with her later under a special olive tree, where she’s sitting with her lamb, like in the picture, singing. He is telling her that he’s leaving for a trip to Venice, and that she should take care of her little sister. But they are interrupted by the village bell tolling. A Turkish ship has been sent by Safiye to find Anastasia. The Turks go to her house on the hill and ask where their daughter Anatasia is. The father lies and says she’s been sent away, but the pasha doesn’t believe it. He finds her hiding with her sister under a trap door. He comes her face to the picture he has of her and pulls her out. She is carried off, with her parents screaming and crying all the way. When the father asks where they’re taking her, they tell him “to the world’s center” and toss him some coins. Istanbul, at the Sultan’s first public presentation. Before going outside, the sultan is presented to his family, who are lined up in a manner we recognize from Muhtesem Yuzyil. Outside, waiting for the new sultan, the Divan members are standing around talking. “May he (the dead sultan) rest in the light.” There is some gossip about the sultan’s sudden death. One of the Giray brothers points out that a very young sultan has taken the throne…that he hasn’t even been circumcised (? ?…I guess he’s 13 in real life, although the actor is clearly much older). During his presentation to the Janissaries and the members of the Divan, he hesitates and asks for water before going out to meet the crowds. His mother panics up in the tower. Ahmet takes heart and goes out. He takes his seat on the throne. The members of the Divan are introduced and approach to kiss his robes. After the Giray brothers are presented, one of them asks another official whether the firman has been signed yet to kill Ahmet’s younger brother. The official says you have to ask the head imam. Giray notes that the rules are clear, he must do this. But Ahmet is remembering his mother’s words, and he suddenly interrupts the proceedings to announce that he has decided to spare his brother’s life. The reaction is muted, until the head of the Janissaries shouts, “Padishah cok yasar,” (Long live the Sultan) and everyone takes up the cry. The reaction in the tower isn’t exactly happy, except for Halime, who had been about to run away with her children. Safiye says, is this how your raise your son, and Handan apologizes and says he’s excited, but soon he will do what is necessary. Safiye orders Halime to take her grandson and return to their apartment. Safiye then says that Ahmet’s decision is not the problem. Surprised, Handan says that the law is clear. Safiye says that our sultan is still very young. First they must have the circumcision. After that, he must take a concubine. 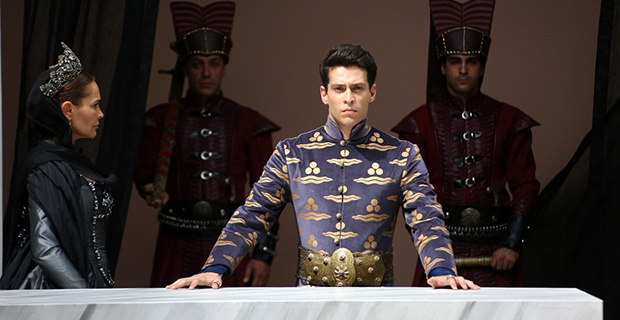 As soon as that girl has a son, a new prince, that should be the time that Ahmet gives the order about his brother. Marketplace. There’s some talk in the marketplace about how young the new sultan is, that he hasn’t even gone to a sanjak to preside over regional government and must therefore be inexperienced. The head of the Janissaires, who led the “Long live the Sultan” cheer, announces that Sultan Ahmet has spared his brother and that innocent boys will no longer be killed. She resists all the way on her trip to Istanbul. She refuses to eat and starts a fight by appealing for help. She tells the people the guys with her are from the palace, and that is enough to start a battle. (The other guys are outlaws rebelling against the throne). While they start fighting each other, she runs away. She meets Alexander, who is a Janissary recruit in training, also headed for Istanbul. She begs him to help her and he takes her to the other Janissaries. Her captors from the palace join them and their leader explains who he is. Apparently, they had to leave their boat and continue the trip overland because of storms at sea. Ahmet basically puts a stop to the conversation. His mother is not pleased. Halime goes to see some pasha, who says, good, you needn’t run away; your son’s life is spared. Halime is not satisfied. She thinks that although Ahmet loves his little brother, his mother will talk him into killing the child. She’s not planning to wait for that to happen. “There are two roads ahead of us, either we die or we ascend the throne.” Pasha: “What do you have in mind?” Halime: “I have a proposition for the Kalenders.” (These are the group who are rebelling against the throne). Dervis comes to the balcony and Handan says she wants him with her son all the time to protect him. Ahmet says he’s already at his side. Dervis swear to Handan that he will protect Ahmet with his own life. Lion Arrival Scene: Down in the palace gardens, a rolling cage arrives with a lion inside. Ahmet asks whose present this is and the Girays tell him they’ brought him the lion. They’ll be pleased if he accepts. If you look into lion’s eyes, you show him you’re the master. You’ll conquer fear and learn to be just.” (aslan gibi). The Giray brother then asks Ahmet what he thinks is the scariest thing about the lion. “His teeth and his claws?” “No, fear. The lion knows that people are afraid of him.” He goes on to imply that if Ahmet can master the lion, he will be able to find his own courage and sense of justice and be a good ruler. The younger Giray brother looks dubious about this whole thing. He obviously doesn’t know the entire plan. Dervis reminds him that the Divan meeting is starting. Divan. The Vezir Azam is away but will be back soon. Meanwhile there are problems Ahmet is surprised to hear about rebellions. Expenses. The royal treasury is short of money. Wars. On the road to Istanbul. Alex tells Anastasia that the Janissaries will stay in Edirne for a while, but later come to Istanbul. Maybe he’ll see her there. She asks him to help her now. He notes that although she might want to escape to find her family, he joined the Janissaries of his own free will, seeking to find a family that way. Still he promises he will find her in Istanbul and help her. He gives his word and she gives him her ribbon to remember her by. And to remember his promise to her. Dancing girls are performing for the Valide sultan (Safiye). The caryies (concubines) are gossiping. We hear that the sultan has recovered from his circumcision and will choose a girl for the halvet. Who will go, I wonder, one girl says, clearly hoping to be the one. At the door, the new Valide Sultan is announced. Safiye, cat in her lap, is not too pleased to hear this, obviously. When Handan approaches, she puts the cat on the chair where she would sit and leaves it there for a few moments before ordering the cat taken back to her apartment. Safiye, “You do know where our cat comes from, right? A gift from our friend Queen Elizabeth.” Handan points out that Elizabeth has recently died. Safiye says she was a powerful woman–a woman like her only comes along once per century, and they should appreciate her value. As she should appreciate *her* value. “This is the end,” she says. She doesn’t want to hear any more challenges from Handan. Meanwhile a message comes for Handan, and we next see her going to the Has Oda to tell the sultan about it. Ahmet is playing there with his little brother. Has Oda (the Sultan’s main chamber). The message that just came was from Egypt saying that his father, the previous sultan, was assassinated. Dervis asks if there’s any proof of these heavy accusations, and she says the Vezir Azam will return from Egypt soon with more information. But that if they’d kill Sultan Mehmet, they might kill Ahmet, too. Handan declares that they have a sultan assassin among them. Ahmet says that’s not possible. Would she kill her own son? 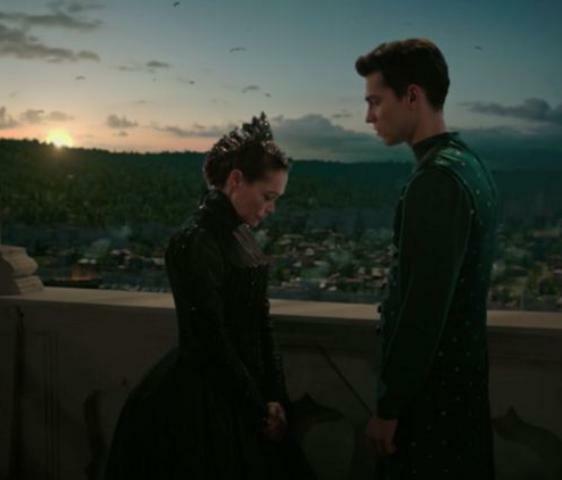 His mother implies that Safiye was responsible for his older brother’s death and she wants to keep power by killing Ahmet and putting the little kid in the throne. Rebel camp. The pasha goes to visit the rebel group with Halime’s proposal. 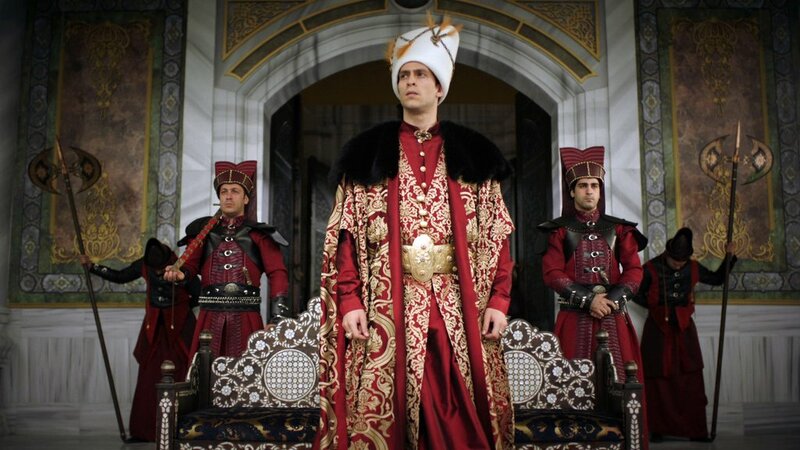 He tells the leader that a child has come to the throne and that the new sultan has promised not to kill his brother. Mehmet Kalender compares Ahmet sarcastically to the former sultans–when it comes to keeping promises, they are not reliable. He claims that his tribe and the Osmanlis and together took over the region, but that the Ottomans have kept all the power for themselves. But the pasha, who seems to be a Chelebi, says that Halime sultan has a solution. If they help get rid of Ahmet and put little Mustafa on the throne, Halime will give his sons all of Anatolia east of Uskudar as beylerbeys of the entire region. Meanwhile, at the palace, Ahmet runs into Halime and her daughter in the hall, and two-faced Halime thanks him for sparing her son’s life. Ahmet goes to feed the lion and there is a metaphor where, at the same time, Cennet kalfa goes to give food to Anastasia…she is clearly being compared to a lion. Ahmet feeds lion but looking into his eyes does not work. The lion attacks, but the chain prevents him from reaching Ahmet. He was told he would conquer fear and learn to be just rather than cruel by mastering the lion. But Dervis insists that the most important thing for ruling right now is simply to stay alive. Ahmet asks him to catalogue and test everything to be sure, but he wants this to remain private. Morning ritual for sultana: She gets her daily schedule, her coffee and Hurrem’s ring! Then Bulbul aga tells her that her gift for the sultan has arrived and Anastasia is shown into the room. Ahmet’s mother’s apartment. Handan hears about the Greek girl that Safiye has brought to the palace. She is not pleased. Harem stairs and hallway: Lady with the cane (Dudu hatun) says to Cennet “There’s only one Valide Sultan here and that’s Handan.” She gives the order to put Mahpeyker with the other cariyes instead of in the private room where Cennet intended to put her. Cennet says this is a special girl, brought her as a gift for the sultan. The other girls hear this. They all study Mahpeyker, and make fun of her because she’s so young. Edirne Janissary Ocak. “I’m Zulfikar. Head of the Istanbul training corps for Janissaries. From now on we’ll be together. Hard road, etc. (they know the proper responses). “There are two families in the world, Muslims and non Muslims.” Alexander is there with the ribbon that he is keeping, reminding him of Anastasia. Anastasia looks suitably impressed with these lies. Valide: “So that’s what happens to your loyalty? You go whichever way the wind blows? Çekilebilirsin.” Safiye has no intention of giving up her power. Ahmet sees his brother playing in the palace gardens from his balcony. The boy’s mother gets a visit from the pasha she sent to the Kalenders. He reports that they promised to start a rebellion to depose Ahmet and put Mustafa in his place. Anastasia takes the cat, Elizabeth, while Cennet fools around with some guy. (How did he get into the harem?) She discovers the secret passage. Sultan’s Garden. Anastasia climbs the vine and Ahmet shows up. Oops. She falls into his arms. Back inside: Cennet finds her and Kosem asks who Bahti is? Cennet want to know where she went. Valide’s apartment: Ahmet goes to see Safiye. He wants to thank her for the gift. She obviously found the girl from the picture. She says, “I was going to present her to you but I guess you’ve already seen her.” She tells him that everybody’s going to do everything to preserve his happiness. Ahmet’s mom looks down on the harem girls and says that no one is to be sent to her son unless she approves it. She asked aga about a girl he mentioned. He points out the girl in blue, who is Mahfuriz. The women in her family are reputedly fertile, which pleases Handan. She wants her son to continue his line as quickly as possible. Instead of answering, Ahmet stalks out to go feed this lion. The Aga outside says Handan will be very angry. The lion attacks, the chain breaks, and Dervis appears and shoots the lion. He calls for the doctor. Dervis examines it and finds it has been cut. Has Oda: Handan sultan: “I told you so. The traitors are trying to kill you. She suspects Safiye, who supposedly wants to put her other, much younger grandson in the throne. Harem: Anastasia wakes up to see the other girl (the rejected cariye) crying. Ahmet looks at his little brother sleeping. He is now having second thoughts about his decision to spare his life. Outdoor garden. Valide sultan is furious. The sultan has summoned her to an outdoor garden. The wind is blowing and a storm is coming (cue metaphor). Ahmet calls Dervis and gives him a letter. He has changed his mind. Now he is asking the chief imam to give him the firman to kill his brother. Harem: Mustafa is in the cariyes’ room, and burns himself on roasted chestnuts. Anastasia helps. Mustafa says he loves all kinds of nuts. A servant comes to take him to his mother. Halime is packing. She is smart enough to know that the attack on the sultan probably spells doom for her son. She tells the kid to get ready and tells her daughter that if not today, then the next day the sultan will kill her brother. Valide sultan is having a massage and Bulbul is talking about the attack. She asks who could have been responsible for the cut chain. He suggests Handan could have done it herself to cause suspicion to fall on Safiye and make trouble for her. Safiye doesn’t think Handan is that clever, but Halime is. She swears to throw her into the Bosphorus herself if she was responsible. The older brother goes off with the aga in private. Younger bro looks suspicious, and sure enough, Halime’s aga, Reyhan, is there to report that Dervis saved the sultan from the lion. Harem: Cennet gives some clean linens to Anastasia. She runs off, as usual. She sees Halime and her kids escaping thru the secret passage and tries to follow, but Cennet returns. She tells her she is to go to the sultan tonight for the halvet. Anastasia tries again to escape being taken to the sultan. The end of episode 1. To watch the episode in Turkish, click here. This episode was summarized by Linda Barlow. Any mistakes are mine and mine alone! This is the synopsis and rough translation for episode 1. The second episode review and English synopsis can be found here. 3rd Kosem episode is now translated here. Linda’s Facebook Page with more Muhtesem Yuzyil.